Thanks to this book, I've had the opportunity to learn a lot more about Robertson. Released this year (2014) by Henry Holt, the biography is written by Sebastian Robertson (yeah, Robbie's son). The illustrations by Adam Gustavson are terrific. The second page of Rock and Roll Highway is titled "We Are the People of the Longhouse." There, we learn that his given name is Jaime Royal Robertson. His mother is Mohawk; his father is Jewish. Allow me to dwell on the title for that page... "We Are the People of the Longhouse." That is so cool... so very cool... Why? Because this book is published by a major publisher, which means lots of libraries are likely to get it, and lots of kids--Mohawk ones, too!--are going to read that title. And look at young Robbie on the cover. Sitting on a car. Wearing a tie. The potential for this book to push back on stereotypes of Native people is spectacular! In the summers, Robertson and his mom went to the Six Nations Indian Reservation where his mom grew up (I'm guessing that "Indian Reservation" was added to Six Nations because the former is more familiar to US readers, but I see that decision as a missed opportunity to increase what kids know about First Nations). There were lots of relatives at Six Nations, and lots of gatherings, too, where elders told stories. The young Robbie liked those stories and told his mom that one day, he wanted to be a storyteller, too. The second album is Contact from the Underworld of Redboy. Get it, too. Back to the book: Ronnie Hawkins. Bob Dylan. They figure prominently in Robertson's life. The closing page has terrific photographs of Robertson as a young child, a teen, and a dad, too. Teachers are gonna love the pages titled "An Interview with My Dad, Robbie Robertson" in which Sebastian tells readers to interview their own parents. That page shows a post card Robertson sent to his mother while he was on the road. Things like post cards carry a good deal of family history. I pore over the ones I have--that my parents and grandparents sent to each other. Deeply satisfied with Rock and Roll Highway: The Robbie Robertson Story, I highly recommend it. There's a new board book out by Cree Metis artist, Julie Flett, and like her other ones, it is a winner! Like her previous works, We All Count: A Book of Cree Numbers is a bilingual board book. In this one, the numbers 1-10 are presented in English and Cree. Flett's collage work is gorgeous. I love the quiet and bold colors she uses in her compositions. Here's the page for number 1. The text reads "One prairie dog perching." And here's the page for number 10, where the text reads "Ten elk crossing." Flett's book is excellent for parents, teachers, or librarians to read to young children. Obviously, this is a counting book, so counting will happen, but the words! Prairie dogs perching! Can you imagine showing the child you're reading to, how to perch like a prairie dog? On the page for number three, aunties are laughing. The joy on their faces is, well, joyful! Laugh along with them! Those owls on the cover? They're six owls spotting. It'd be great fun to pause on that page, and peer about, spotting things nearby. I really like this book. I'm as joyful as those aunties! The pages in Flett's book provide a chance to do something that extends the reading itself, enriching what a young child knows about words and actions. 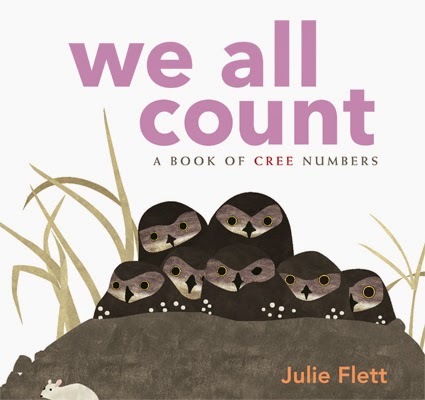 Though I'm sure Flett didn't have diversity in mind when she came up with the title, We All Count, the title and her book do a beautiful job of saying We--people who are Indigenous or who speak Cree--we count, too. We All Count: A Book of Numbers is highly recommended. Written and illustrated by Julie Flett, it was published in 2014 by Native Northwest. There's a lot to like about K.V. Flynn's On The Move. As far as I know, Flynn is not Native. His main character, Callum, isn't Native either, but a Native kid named Obbie figures prominently in this middle grade story set in California. He's not the sidekick who will be the first to die. He's the real deal. That is, a Native kid who is grounded in his identity as a Native kid. It is a natural part of who he is--which is, one of several boys who hang out together. They are skateboarders. In the first three chapters, we learn that Obbie is Native and that he spends his summers on the reservation with his dad. This is done quite naturally. We learn it through the boy's conversations. "You cannot use The Absolutely True Diary of a Part-Time Indian for Kroos's final, Obbie." Mateo was sure that Ob was about to make a critical error and not make it out of eighth grade English alive. "Your book has to be set entirely outside the U.S."
"But it's on the reservation," Obbie explained with his last bit of patience. "That's a sovereign nation." "You guys laugh all you want. But I'm telling Miss Kroos an Indian rez is not America, and that's the book I read." Though Obbie was out of patience, it is a friendly exchange (these guys like each other a lot) that is told as a flashback in Callum's memory. Let me back up. 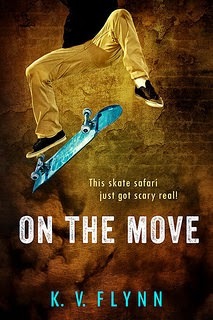 The book itself opens with Callum, Levi, and Apollo at a skateboard camp, shortly after the school year has ended. They've said their good-bye's to Obbie and Mateo. Out of the blue, the United States is attacked. Major cities are bombed. The boys at camp worry about their parents, and, they worry about Obbie and Mateo, too. Did Obbie make it to the reservation? Most of the story is about the kids and their efforts to be reunited with friends and family. I gotta say that all the skate talk flew right over my head. There's a lot of it and I'm sure it'll be a hook for kids who spend hours on skateboards, trying this or that ramp or trick. The obvious hook for me is Obbie, but I like intriguing stories where teens deal with catastrophic events (like Matt de la Pena's The Living), and stories where science and technology are woven into the plot. I like Obbie and I like how Flynn has developed and presented him. He doesn't talk much about the reservation during the school year. It is boring there, he says. I've heard plenty of kids at home (on our reservation) say that, too. Obbie pretty much has to go up there to see the Native side of his family (his mom isn't Native) because they don't go down to California much. From Flynn's website, I learned that this is the first of three books about these boys. I'm wondering if we'll learn more about Obbie's parents. How did his Native dad and his white mom meet? What caused them to split up? The boys desperately want to communicate with parents and friends using their cell phones and computers (when they can find one) but the bombs have destroyed a lot of the infrastructure that makes that communication reliable. Connections are fleeting and old school (they learn what dial-up is and how to use it) but good enough for them to learn that Obbie is with his cousin, Suri. They are fine. The four boys make a plan to meet up and head north together. Most everyone that survived the bombings, they learn, is headed north. Callum, Levi, and Apollo head north on their skateboards. When they meet up with Suri (she has a truck) and Obbie, they pile into the truck and keep going north. Before long they come to checkpoint of sorts, set up by some bandits. They ask Suri what she's doing with this bunch of kids, and she says that she and Obbie are Yakama and headed to the Yakama Reservation to join their family, and that they found the kids and are keeping them safe. One of the bandits, it turns out, is Native, too. He's told to "get rid of them." Callum thinks that means its all over, but he lets them go instead, keeping their money. They jump back into the truck, turn around, and find another route, again, heading north. "D'you mean here, by the Pyramid Lake Reservation?" It is a small thing, but a meaningful one. It is one of many moments where a reference to Native people or culture is just dropped in, seamlessly. The map above/right shows the location of the Pyramid Lake Paiute Tribe in Nevada and the Yakama Reservation in Washington. "Nah, that was a hundred years ago. They have houses and cars. A school. Normal stuff." "They're from there! We were always there. Our tribe is native around that area, they say. Oregon, Washington, those parts. What, d'ya think Lewis and Clark actually discovered some place empty?" "Yeah, until the gold rush. Then all those miners came. Brought measles and smallpox galore. I think, like, ninety percent of Native people around here died." "The rest were captured by the Californios. Used as slaves and stuff. Especially the little kids. The new miners thought the Native Americans were competition, and they were so frantic for all this gold, that the settlers brought a lot of violence, too. Raided the villages. Sold the women. Seriously bad news." Obbie knows a lot of history and doesn't hesitate to share it. This is more than the one or two lines that Lynn drops in, seamlessly, but it works, too. There's more, too, when they get to a town with a community college. Suri and Obbie head over to it, thinking that the Native American students there, in the First Nations Student Union, would have information about their reservation. When On the Move draws to a close, the kids are reunited with their families. I should note that there's a bit of a mystery throughout having to do with one friend who dies early in the story. I'll leave that alone, so as not to divulge everything that happens in this story. In short, I liked Flynn's On the Move. Published in 2014 by Wynnpix Productions, I think there's plenty in it for Native and non-Native kids to grab on to, and I look forward to more from Flynn. 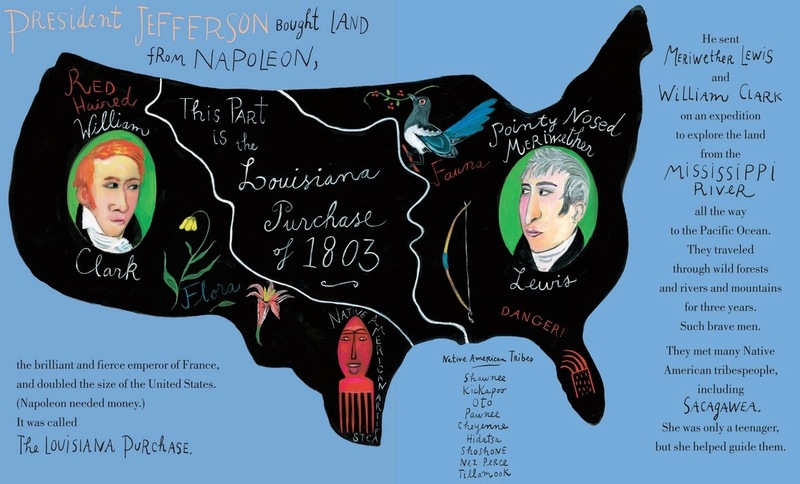 Maira Kalman's Thomas Jefferson, Life, Liberty and the Pursuit of Everything got starred reviews from Kirkus and Booklist. Horn Book noted its candor and substance, and The Bulletin of the Center for Children's Books praised Kalman's candid discussion of Jefferson's contradictory views about slavery. Me? The title alone brought me up short. As far as I've read, no one else has noted the title. Apparently, the author, her editor and publisher, and obviously the reviewers, did not think how a Native person--especially one whose ancestor's were removed from their homelands--would read the phrase, "The Pursuit of Everything." Like the presidents before him, Jefferson wanted land. Like presidents before him, Jefferson chose to act as though Native people were primitive hunters. He wanted them to be farmers, not hunters! In fact, Native peoples of their respective nations all along the coast had been farming for hundreds of years, and Jefferson knew that. He wanted them to stop hunting, though, because if they did, they wouldn't need all that land. But it was their land. Treaties said so! So, what to do?! Jefferson wanted that land! To promote this disposition to exchange lands, which they have to spare and we want... we shall push our trading uses [familiar trading customs], and be glad to see the good and influential individuals among them run in debt, because we observe that when these debts get beyond what the individuals can pay, they become willing to lop them off by a cession of lands. See that? Jefferson's idea was to give them credit at trading posts, knowing that when they couldn't pay off that debt, their land would be used to pay it off. Today, don't we call that predatory lending? You may wonder... are Native people in Thomas Jefferson: Life, Liberty and the Pursuit of Everything? Kalman included Hemings and slavery... did her candor extend in any way to what Jefferson said or did with regard to Native people? We're told he had an Indian artifact in his home. Nary a mention on that page of tribes as Nations with whom the US government had treaties with... Just the names of some of them, and the words "artifacts" and "danger" and "tribespeople" and of course, the name of one person in particular, Sacagawea. Fact: Moving Native peoples off their homelands made it possible for white people to pursue everything on that land. Thomas Jefferson: Life, Liberty and the Pursuit of Everything keeps that particular fact off the page. Isn't that a problem? For all of us? Native and not? If young readers can handle Jefferson's affair with Hemings, don't you think they'd be able to handle a candid page of information about Native Nations, treaties, and, about US policies on land acquisition? Thomas Jefferson: Life, Liberty and the Pursuit of Everything, published in 2014 by Penguin Books, is not recommended. Last week, the Guardian published an article by Kathleen Hale that detailed how she had stalked a blogger who wrote a negative review of her book. Understandably, the article prompted a great deal of conversation on social media, with many bloggers expressing fear about being stalked. Amongst the responses to Hale were ones that said that reviews are about books, not their authors, and that an author should not take reviews personally. A book, some say, stands alone. The author does not matter. I appreciate that response but am hitting the pause button. Here's why. Teachers assign author studies. There are guides on how to do them. Publishers like Scholastic offer guides, too. In them, students are asked to do research on the author's life, and that author's body of work. They are asked to make connections between the author's life and work. They are also asked to make personal connections between their own life experiences and those of the author and/or characters in the author's books. Given the amount of conversation that took place over Kathleen Hale's article, I'm pretty sure a student doing an author study of her will come across the article. I hope they come away from it thinking that Hale went too far in stalking the blogger. Perhaps, in the days to come, we'll learn more about why the Guardian published that piece, and, because I think Hale was wrong to stalk the blogger (she paid for a background check on the blogger, and later rented a car and went to the blogger's home), I hope that the Guardian editors add a note to the top of that article, linking to responses from the blogging community. On AICL, I've said that authors matter because I know that teachers ask students to do author studies. My preference is that teachers assign books by Native writers because when the book is assigned, the teacher can say, for example, "Cynthia Leitich Smith is a tribal member of the Muscogee Creek Nation." The teacher can show students Cynthia's website and the website for the Muscogee Nation, too. In doing that, the teacher will be using present-tense verbs ('is' and 'are'), and pushing against the idea that American Indians no longer exist, and, against the monolithic and stereotypical image of American Indians as people in feathered headdresses who lived in tipis and hunted buffaloes. In short, an author's identity matters, and it is why I advocate for Native authors. Back to Kathleen Hale. Here's some of the responses to her article. Please read them, and, learn about stalking, too. Start with information provided at the Stalking Resource Center.